(WEBPUBLICAPRESS) BERLIN – A new leftwing movement has been launched in Germany, despite skepticism. Its founder Sahra Wagenknecht says a “crisis of democracy” has emerged because prosperity is no longer being shared among German voters, DW (Deutsche Welle) reported. Sahra Wagenknecht, co-leader of the opposition Left party’s group inside Germany’s federal Bundestag parliamentary chamber, defied skeptics Tuesday in Berlin by launching Aufstehen (Stand Up), a cross-party leftist movement. She said the “alliance” had 101,000 adherents who had signed up to the project — billed by some media as resembling grassroots movements in Britain, France and the USA that are intent on regulating ”neo-liberal” capitalism. Prominent Aufstehen backers include veteran Greens politician Ludger Volmer, dramatist and author Bernd Stegemann, Social Democrat (SPD) parliamentarian Marco Bülow and Wagenknecht’s husband, former SPD leader turned former Left party leader Oskar Lafontaine. Also at Tuesday’s launch was Simone Lange, mayor of Germany’s northern port city of Flensburg and a recent federal SPD leadership challenger. Lars Klingbeil, the general secretary of the SPD currently in Chancellor Angela Merkel’s coalition cabinet, dismissed Aufstehen as a “power struggle” within the opposition Left party – amid conjecture over a further leftist schism. Social Democrat vice-chairman Ralf Stegner warned members of his SPD against joining figures he termed “notorious separatists,” like Wagenknecht and Lafontaine. “That is no project of the party Die Linke, insisted Left party executive official Jörg Schindler, adding that its originators were Wagenknecht and Lafontaine. 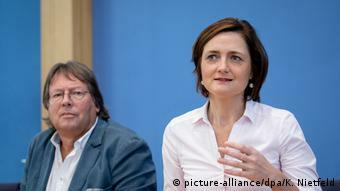 The launch of Aufstehen follows last September’s first-time entry into the federal parliament of the far-right Alternative for Germany (AfD) party, making it currently the largest opposition grouping with 92 seats. Last week, Left party co-chair Katja Kipping had said she would not join the new movement led by her inner-party rival Wagenknecht. 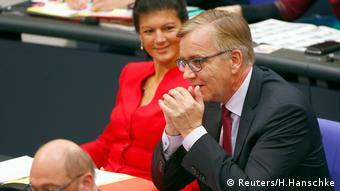 Dietmar Bartsch, who shares the Left co-leadership with Wagenknecht inside parliament, told public broadcaster SWR on Tuesday that every idea was welcome. Although the Left was active at many locations, it had to admit that it “alone it is not capable of bringing about societal changes,” Bartsch said. At Tuesday’s press conference, Wagenknecht, who grew up in former East Germany, said the country’s climate was becoming “rougher” because not all its 82-million population was benefiting from export-led prosperity. “Despite economic growth, 40 percent of residents have less net income than 20 years ago; democracy is no longer working,” she said. Accumulated rage among those who “no longer feel represented by those in power” had contributed to recent far-right-mobilized unrest, she asserted. “The events in Chemnitz have shown that it can no longer continue as it has,” Wagenknecht said, referring to last week’s anti-foreigner violence in Saxony state and her past warnings that an “open borders”-Germany was unrealistic. “I’m sick of letting the streets being taken over by PEGIDA and the [far] right,” she said, referring to the self-declared anti-Muslim movement initiated in eastern Germany’s Saxony state in 2014. She had earlier said Aufstehen had been initiated by a group of 80 authors, artists and professors and said its goal was to “bundle” left-wing efforts and, medium-term, set the agenda for a future leftist federal government. Germany’s three left-of-center parties – the SPD currently in government with Merkel, the opposition Greens and the opposition Left – amassed under 40 percent in the last federal election of September 2017. While the former “working man’s SPD” now polls about 20 percent, the ecologist Greens under a new leadership are currently upbeat, ahead of elections in the regional states of Bavaria and Hesse (which includes Frankfurt) slated for October. On Monday, Greens party co-leader Annalena Baerbock said Aufstehen ”was not my alliance” because its adherents had not taken to Chemnitz’ streets to protest against far-right demonstrations last week.